A good kitchen remodel will make you want to use it more! Now that 2017 is nearly upon us, you’re probably reflecting on the past and how you can make next year even better. While you’re making resolutions, now is a great time to consider how you can get more out of your kitchen — for both you, and your family. 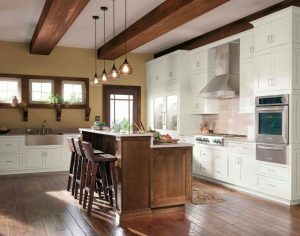 Here are a few reasons you might want to add a kitchen renovation to your list of New Year’s improvements. You’ll want to cook more. Eating out all the time is not a good way to stay on your new diet. A home-cooked meal is much healthier, usually more satisfying and certainly more affordable. Still, if you don’t have a kitchen that you enjoy being in then you probably aren’t making the most of it. A kitchen renovation can help get you organized and make your space more accessible – which means mealtime preparations will be easier and more enjoyable. A new kitchen adds a ton of value. While a kitchen may be one of the costliest rooms to renovate, it can also sell a home. That’s because home buyers tend to look at the kitchen first. Using a professional kitchen designer can not only make the process more smoothly – it will help you stay on trend. More entertaining space. If you struggled for space while throwing your holiday parties in 2016, now’s the time to start considering a kitchen makeover. Isn’t the kitchen the place where everyone wants to gather? Let your NEW kitchen be the life of the party! Save on your energy bill. If your energy bill was too high last year, consider installing more energy efficient light fixtures and appliances. Check the energy ratings on new appliances before you buy. It may also be worth investigating potential cracks in and around doors and windows that may be letting precious heat out. Keep in style. Come on… you change your wardrobe and probably your hairstyle to keep up with the latest fashions… Your home is an extension of who you are and the kitchen is the most important room of the home. Why not make your kitchen match who you are? Ready to get started on your next kitchen or bathroom remodeling project? Kenwood Kitchens can help. Since opening its doors in 1974, Kenwood Kitchens has made a name for itself throughout Maryland as a complete kitchen and bathroom remodeling firm. With showrooms located in Lutherville, Abingdon, Columbia or Annapolis, Maryland, Kenwood Kitchens is the place for all of your kitchen and bathroom needs. We’re also featuring a special Wood-Mode savings event until February 24th, 2017. Don’t hesitate to give us a call at (800) 211-8394. This entry was posted on Monday, December 5th, 2016 at 3:49 pm. Both comments and pings are currently closed.